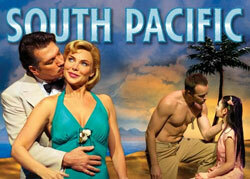 Musical Theatre News: South Pacific to take over from The Wizard of Oz at the Palladium? South Pacific to take over from The Wizard of Oz at the Palladium? FACT: Samantha Womack was due to leave the tour of South Pacific at the beginning of March but is now staying on for the remainder of the run sharing the role of Nellie Forbush with Rebecca Thornhill. The tour is currently scheduled to end at Woking on 21st July. FACT: The new Wizard and Dorothy - Russell Grant and Sophie Evan - are currently contracted until 13th May so if the ailing show does not continue over the summer months South Pacific could easily be there by the Autumn.